On this beautiful day when we open our hearts anew to the Holy Spirit we also celebrate the Beatification of Archbishop Oscar Romero. This morning, as we speak, he is being beatified in San Salvador where he served as Archbishop until he was killed in his Cathedral in 1980. How grateful we are to Pope Francis for his decision to beatify this priest and bishop who modeled his life on Jesus by opening his heart to the Holy Spirit. Let me speak about this theme for a few moments. We are all disciples of Jesus, our Savior, the Son of God made man. At every moment of his life Jesus was filled with the Holy Spirit. He was conceived in the womb of Mary by the power of the Holy Spirit. He was overshadowed by the Holy Spirit when he was baptized in the Jordan. The Holy Spirit is the bond of love between the Father and the Son. When we are weighed down by our sins, we think of how merciful Jesus is. Pope Francis refers to Jesus as “the face of mercy”. Jesus’ love for us is stronger than our sins and more powerful than death itself. In the Beatitudes, Jesus says: “Blessed are the merciful; mercy shall be theirs.” No one is more merciful than Jesus. He is the source of mercy in our lives. And when we think about our struggles with illness or broken relationships, we think of how Jesus went about doing good, healing the sick, and giving people the courage to live as true sons and daughters of God our Father. In his goodness and gentleness Jesus loved the poor and the sick. He identified himself with the poor. Whatever we do for those who are hungry, naked, sick or imprisoned, we do for Jesus. And even though Jesus spoke with gentleness and love, he did not hesitate to speak out courageously against those who were selfish and those who laid heavy burdens on other people’s shoulders. He spoke of Lazarus who was condemned in eternity because he would not help the poor man at his doorstep. He told us that unless our “righteousness exceeds that of Scribes and Pharisees” [we] will not enter the Kingdom of God” (Mt. 5:20). Because Jesus spoke out against the leaders for corrupting the faith and for ignoring the sick and the poor, he was condemned. He died to liberate our souls for sin and from sinful oppression. Meanwhile, the Apostles were with Jesus from the beginning. They listened to him as he preached the Good News. They watched as he touched so many people with the power of God’s love. They prayed with Jesus and asked him in private to explain what he had said publicly. All the while, Jesus was getting them ready for their mission to spread the Gospel. But the Apostles often misunderstood Jesus. Sometimes Jesus rebuked them for their hardness of heart. When Jesus was condemned to death all but one abandoned him. After the Resurrection, the disciples rejoiced to see the Lord but they were still confused and fearful. It was only with the coming of the Holy Spirit that they really understood who Jesus was and what he preached. They went out and began to proclaim the Name of Jesus fearlessly and liberated many minds and hearts from the oppression of sin. Their courageous witness to Jesus cost them their lives. Dear friends, it’s not really hard to see how Archbishop Romero modeled his life on Jesus and the Apostles. He was the son of a carpenter just as Jesus was. He entered the seminary when he was only 13 just as Jesus was found in the temple with the teachers of the Law of Moses. He studied in Rome when Fascism was on the rise and on his way back from Rome was arrested in Cuba. As a priest and bishop he remained a gentle, prayerful, even a quiet man who preached the Gospel, celebrated the sacraments, & tended to the sick & poor. Soon after he became the Archbishop of San Salvador his close friend, Jesuit Father Rutilio Grande, was assassinated for helping the poor in El Salvador organize themselves into “self-reliance” groups. While remaining a gentle and loving pastor, Oscar Romero, filled with the Holy Spirit, became a fearless advocate for the poor and the marginalized. He spoke out publicly against the killing of innocent priests and poor people. He spoke out against the violence, the lies, and disinformation. Like Jesus, the Good Pastor, Oscar Romero did not hesitate to speak against the rich and powerful for oppressing the poor. He wrote to President Carter and to members of the Congress. In his preaching, he showed how Jesus’ truth and love liberates the human spirit. He bore witness to the dignity of the human person and the truth and power of the Church’s social teaching. He promoted economic reforms and other measures to alleviate poverty. His witness to human dignity fully revealed in Christ cost him his life. 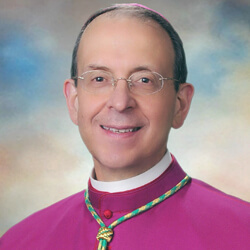 He was struck down in his Cathedral Church in San Salvador in 1980. He asked, “To what truth am I giving my life?” The answer is that he gave his life for Jesus, the Way, the Truth, and the Life. In the power of the Holy Spirit, the witness of this holy & courageous pastor lives on. As we celebrate the feast of Pentecost, let us open our hearts anew to the Holy Spirit, the Spirit we received in the Sacraments of Baptism and Confirmation. Let us ask for the grace to follow Blessed Oscar Romero’s example: to strive to be holy and gentle like Jesus, yet also courageous in bearing witness to the faith, generous in serving the poor and the needy, and tireless in working for a society of justice and peace. Let us also seek the intercession of Archbishop Romero that the Holy Spirit may enlighten our leaders to defend human dignity from the moment of conception until natural death, to help young families educate their children in good schools, including good Catholic schools like Archbishop Borders here in Highlandtown, to work to alleviate poverty and injustice, and to welcome immigrant families into our country. Blessed Oscar Romero, pray for us!